Data Aggregator – an accredited agent appointed by a supplier to collate and sum meter reading data. Daily indices compiled by LEBA (London Energy Brokers Association). The Day Ahead Index is calculated using a volume-based, weighted average of all Day Ahead baseload trades executed in London by contributing brokers between 0700hrs and 0900hrs each day. Represents the theoretical margin for a coal fired power plant. If a dark spread is positive, then the price of the power is higher than that of the fuel and the spread is profitable. The catalogue of data flows, data definitions and data formats in the form approved under the MRA. The DTC accommodates the inter-operational exchange of information enabling effective interface between industry participants. A form of spot market where products are traded for delivery in the following day. Data Collector – agent appointed by a supplier to retrieve and verify meter readings data from electrical meters to include processing, validating and estimating. Data Communication Company The Department of Energy and Climate Change (DECC) granted Smart DCC Ltd a licence in September 2013 to establish and manage the data and communications network to connect smart meters to the business systems of energy suppliers, network operators and other authorised service users of the network. Smart DCC Ltd is a wholly owned subsidiary of Capita plc. The data and communications infrastructure will: -operate consistently for all consumers regardless of their energy supplier -provide smart metering data to network operators in support of smart grids -allow authorised third parties to provide services to consumers who have granted them permission to use their data. Consumers can benefit by receiving energy services and advice on how to reduce their energy usage. See Distribution Connection and Use of System Agreement. The movement of any isolator, breaker or switch or the removal of any fuse whereby no electricity can flow. The full definition is given in schedule 1 of The electricity class exemption order no.3270. The DNC is the maximum power available from a generating station on a continuous capability basis less any power used to run the station. In the case of solar, wind, tidal or wave power the physical maximum continuous power is multiplied by a factor reducing the effective DNC. The factors are: Tidal, wave 0.33; solar 0.17; and wind 0.43. A measure of the variation of one day's temperature against a standard reference temperature, typically 65 degrees Fahrenheit (18 degrees Celsius). Degree-days are used as a base for temperature-related weather derivative deals. There are both cooling degree-days (CDDs) and heating degree-days (HDDs). For example a firm take out a 30-day CDD swap with a reference temperature 65 degrees F, and the average temperature on each day is 70 degrees F. The company is then due 150 (30 x 5) degree-days multiplied by the sum of money agreed for each degree-days. If the firm had taken out an HDD swap, it would have owed the same amount of money. The load shape, or pattern of energy usage over a given period of time, usually daily, seasonal or annual. Standard profiles take an assumed form of electricity usage in half hourly slots for every day of the year. Demand side response (DSR) - involves electricity users varying demand due to changes in the balance between supply and demand, usually in response to price. A financial instrument derived from a cash market commodity, futures contract or other financial instrument. Derivatives can be traded on regulated exchange markets or over-the-counter. For example, energy futures contracts are derivatives of physical commodities, and options on futures are derivative of futures contracts. Customers who use less than 12,000 (with a few exceptions) units of electricity a year. 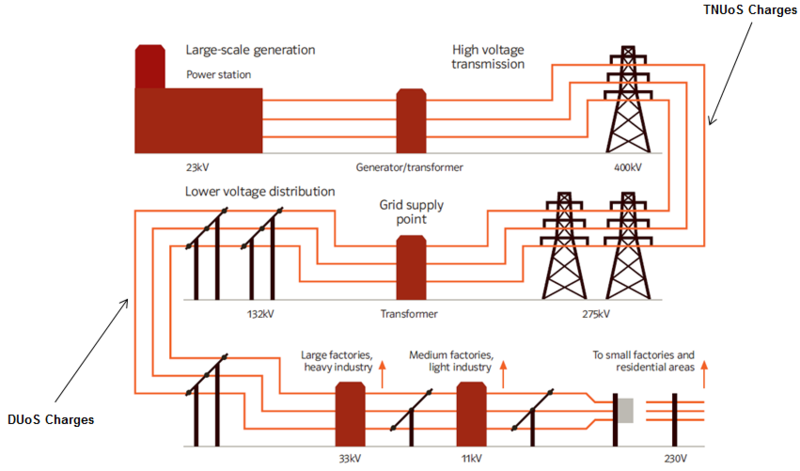 Generation plant that is connected to a distribution network, i.e. not to the transmission network. The Distribution Connection and Use of System Agreement (DCUSA) was established as a multi-party contract between the licensed electricity distributors, suppliers and generators of Great Britain. It is concerned with the use of the electricity distribution systems to transport electricity to or from connections to them. The DCUSA replaced numerous bi-lateral contracts, giving a common and consistent approach to the relationships between these parties in the electricity industry. It is a requirement that all licensed electricity distributors and suppliers become parties to the DCUSA. Electricity lost in the distribution system. The owner and operator of the local distribution networks. The DNO holds a distribution licence for the provision of network services in a defined area, including connection to the system, metering and data services. The DUoS charge covers the cost of receiving electricity from the national transmission system and feeding it directly into homes and businesses through the regional distribution networks. These networks are operated by Distribution Network Operators (DNOs) such as Central Networks. The distribution networks include overhead lines and underground cables, as well as substations and transformers, which reduce the electricity’s voltage to safe levels for use in homes and businesses. Data Transfer Network – the electronic network provided to transmit all market participant data flows (as defined in the DTC) between parties.